The play had stopped and Roberts cried: “He’s on a lead, he’s on a lead!” Laughter filled the commentary box as a small pig that resembled the likes of the famous Babe, rather than the modern-day Peppa variety, ran riot on the paddock of the Sydney Cricket Ground. Roberts called for a runner (at least) to go out there and pick up the pig. On cue, the control room shot to boundary-side vision of an unfathomable event. The cameraman was fixed for what was almost three minutes as the Sydney Swans runner had duties outside of running water – not chasing the players to keep hydrated, but to retrieve a pig on the loose. Roberts, still perplexed at the chaotic scene that had stopped the football match, felt like he was searching for something to say, something to fill the void. So he went with: “Number four, Plugger. It’s only a joke Plugger if you’re watching. This could go on for some time.” It did. In what would be one highlight of his career, Sydney Swans defender Darren Holmes may be best known for wearing no.31 that day as he tackled the pig and forcefully handed a club assistant the rogue pig. Whenever in the history of football did an event like this happen to such an iconic figure of the game? If you look through the record books and old tapes you’ll find a lot of things, but you’ll never find anything like the pig portrayed as Plugger. It’s still, to this day, a uniquely original Tony Lockett moment. For Sydney Swans supporters, the three wooden spoons from 1992 to 1994 is not something to remember fondly. But midway during this languishing period provided an opportunity like no other that we’ve seen before. Round 18, 1993 was more than 8,600 days ago, but many supporters may remember a specific game more than any other from the year of the Baby Bombers. A bright and sunny Sunday afternoon in the Sydney suburb of Moore Park proved an opportunity like no other. The release of the swine on to the SCG was something that remains unthinkable in the modern era. The incorrectly spelled “Pluga” was spray-painted on one side and the number 4 on the other as the “pig at full-forward” taunt was issued by the Sydney folk. Never mind the free will and lack of distress appearing on the pig, or animal rights groups who would dispute it today; bringing a pet – let alone a pig to a football match – is something maybe only country football can still relate to on a weekend of dealing livestock on the side. And a country boy he was. Anthony Howard ‘Plugger’ Lockett inherited his name from his father, Howard, who would be known to “plug around” in the garden before passing down the name to his son. The boy from Ballarat wasn’t playing that day the pig was released, but with the context and metaphor of the pig at full forward, Plugger took it personally watching St.Kilda on the television from home. Due to injury suffered a month beforehand, it barely affected his beloved-Saints as they went on to win a standard old-fashioned shootout 155 to 118. Unknowingly to Plugger at the time, he would be traded to the opposition just more than a year later, where he would go on to kick his record 1300th goal at the same ground albeit in opposing colours six years on. But the Brownlow Medalist would get his revenge on the Swans in the following year. He pulled the Saints back from 51 points down to grab a one-point victory, kicking 11 goals and was credited with breaking the nose of Swans defender Peter Craven. Such was the hysteria around the SCG at the time of Pig Gate, it is rumoured a few of the Sydney players including Scott Watters (who would go on to coach the Saints) put their hand in at a Melbourne pub the previous week, and had met an eavesdropper named ‘Joe’ who knew how to put Plugger off his game – not that he was there of course. One must wonder if there is more to it than simply releasing the farm animal on the day. Perhaps it was fitting that of all leading goal kickers in the league, Plugger was the one to have a country farm animal released upon the SCG paddock. Such was the reference to Lockett’s stocky build; it also took aim at his dominance on the top end of the Coleman Medal each year. 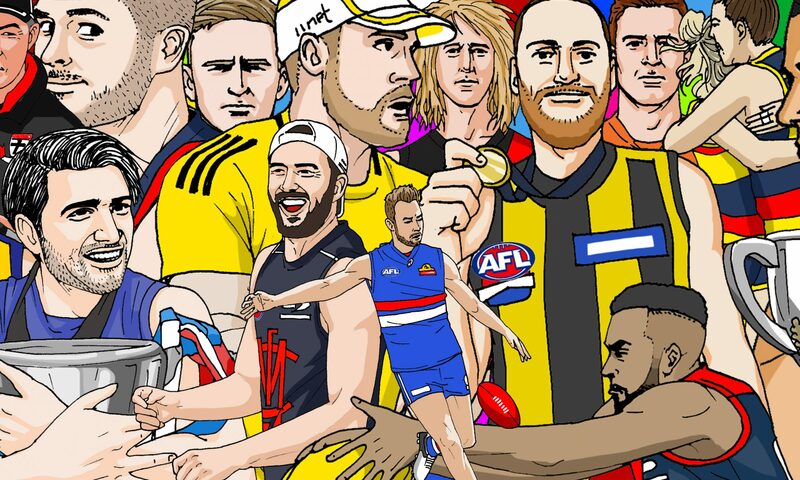 In what is essentially a compliment or perhaps a testament to his goal kicking ability, it can’t be denied the four-time Coleman Medalist’s 1360-goal record will unlikely be broken. Passing the ball off in the 80s and 90s was considered a sin for a full forward; they were there for one reason and that was to kick the goals. Like many great footballers, Plugger’s career was filled with highlights on-field and frustrations off-field. From throwing his crutches at a young journalist by the name of Edward McGuire in a doorstop interview, to having a song written about him, almost signing a three-year deal with Richmond before an eleventh-hour bid saw him move to the Harbour City, and starring in a somewhat-forgotten Campbell’s soup advertisement. When Plugger left Victoria, he paved the way for a raw Barry Hall to take the Saints to a grand final loss in ’97, a year on from scoring the behind after the siren in the Preliminary Final but also admitting defeat to the Swans own failure on that one day in September. The Coleman medalist achieved an accolade of individual awards including the Brownlow Medal in 1987; where essentially he was the last full forward to win the award before it became the midfielder’s medal. One last attempt at team success failed when a three-game, three-goal comeback with the Sydney Swans in 2002 was his quest for a premiership before a second-retirement. Not discounting the dog invasion at an International Rules match at Croke Park in 2004 who chased the ball, the elephant at Arden Street for a promotion in the 70s, and the failed attempt to have an actual lion at Brisbane home games in 2015 (what could possibly go wrong? ), there have been few other moments where animals have entered the playing arena. Though one could argue that many players behave like animals once they cross the white line. However, it’s that moment on that sunny day in Round 18, 1993, Plugger, the pig and the paddock which stands out the best. In what is possibly the greatest pitch invasion ever (Helen D’Amico putting Richmond off their game in the 1982 Grand Final, or even Andrew Symonds shouldering the cricket streaker against India would argue to be greater), the plan backfired for the Swans. They got their man a couple of years later, but they lost both the match, and a massive haul the following season. However, the prank had its merits and is still considered one of the greatest moments of the 90s. After all, there’s only one Tony Lockett.